One of the many things that photographs do is to function as mirrors, reflecting ordinary and everyday human behavior. And because they have the capacity to stop action, they invite us to contemplate what we regularly take for granted. Sometimes, however, they capture the exotic, or the down right bizarre, inviting us to meditate on the ordinary as it is “reflected” by the extraordinary. Nonhuman animals, whether wild or domesticated, often stand in for humans, embodying and performing all manner of emotions (like compassion), affects (like raw fear), and norms that invite a more complex or revealing understanding of the “human condition” than we might get by looking at humans alone. The photograph above is a minor case in point. 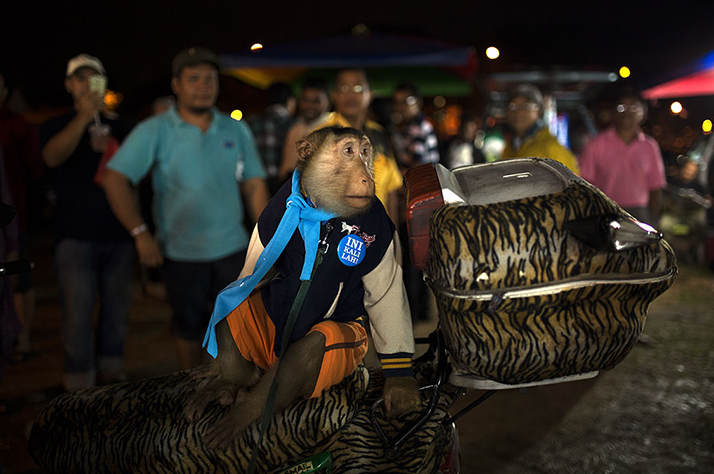 The scene is in Kuala Lumpur; the monkey, who is the focus of the image and wears the flag of the People’s Justice Party, rests on a motorcycle and attends to a speech by Anwar Ibrahim, the leader of the Malaysian opposition. The monkey wears the flag of the opposition party, so we can assume he (?) is a supporter, but more to the point, is that he is altogether other-directed, respectful of and attentive to the speaker. A somewhat rare thing in this day and age. And not just attentive, but contemplative, as he appears to listen with care, weighing each and every word spoken. While only a domesticated animal he nevertheless seems to be a mature model of civic decorum. By contrast, the photograph below tells a different story. Here we have Aaron Schock, the representative from Illinois’ 18th District and the youngest member of the House of Representatives. 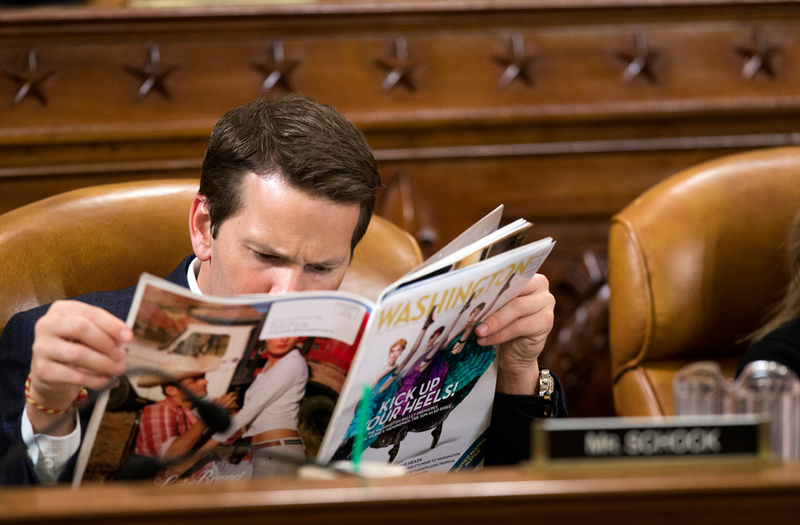 He is intently reading the April issue of Washington Life magazine, which advertises itself as “D.C. Metro area’s premiere guide to luxury, power, philanthropy, and style.” There is no way to tell what in particular has captured his attention, but one of the featured articles this month discusses how to beat the stress of tax day and perhaps that is what has him so entranced. Or maybe it is the fashion report on “Barbie’s new Swag.” Whatever it might be, it must be pretty important given that just outside of the frame of the picture Health and Human Services Secretary Kathleen Sebelius is testifying to the House Ways and Means Committee on Medicare spending. Given that Schock serves on the House Ways and Means subcommittee on Social Security one would think that he would be concerned about issues related to health care spending for the aged—particularly given the prevailing attitude of House Republicans towards budgeted funding for social welfare programs—and thus would attend carefully to the testimony before engaging the Secretary in dialogue; or at the least we might think that he would show some respect for the speaker as a matter of civic decorum in the most important legislative assembly in the nation. But apparently we would be wrong in making either assumption, or at least that is what the photograph would invite us to consider. What the mirror here reflects is a self-indulgent and rude individual who appears to show no concern for the gravity of his office or those he serves. Placed side-by-side the two photographs mirror the extraordinary and the ordinary. Upon reflection it is not clear which is which. But the only real question is: with which are we willing to identify?